The Ollendorff Center is a 501(c)(3) non-profit foundation founded by Stephen and Bjørg Ollendorff in 2001. The trustees of the Center are Angelica Berrie, Rabbi Jack Bemporad, Bjørg Ollendorff, Stephen A. Ollendorff and Lew Solomon. 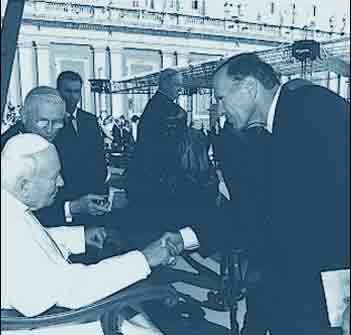 Stephen Ollendorff presents a copy of Fate Did Not Let Me Go to Pope John Paul II at the Vatican. The Ollendorff Center for Religious and Human Understanding supports organizations that promote human and religious understanding throughout the world. All of our materials are available to the Rabbis or administrators of any synagogue, school or community center who wish to use them within their educational system. Learn about the School Guide and how to obtain educational versions of the book and film.